Despite being a bit burned out on vintage from all the Gatsby preparations I did, I was excited to head out to the San Francisco Vintage Fashion Expo this past weekend. Although I didn't have any event in mind to shop for, I managed to find a couple of dresses I couldn't resist buying. Most of the stuff I really loved was out of my price range, but I managed to find dresses in need of a little bit of TLC. For that reason, I think I got them at great prices. We can't think of a better sentiment for a child's glow-in-the-dark tee than this one available at Threadless. In light, the message allows your little one to assert his or her toughness. In the dark, however, the directive is clear. Unless you were Joseph P. Kennedy, Sr., it's pretty safe to say that no parent can predict their new baby's future career path or what they are to become. However, with a little help from Mysterio, new parents can get a glimpse of their child's future. These infant shirts, with their retro old magic look are great gifts for those new parents with a sense of humor. Shirts remain a surprise until you open their decorative pouch. Just don't be disappointed when your precious little one faces a future as a professional bowler. Shirts are $13 each and available at Uncommon Goods. Swirl Syndicate for multi-culti cuties was inspired by African-American designer Leigh-Ann Jackson's daughter, whose paternally-inherited fair features and red hair drew "double takes" from passerbys. Leigh-Ann's response are these cute and playful children's T-Shirts that celebrate multi-culturalism. We're especially fond of White Bread + Rice. We just have to ask: what child wouldn't be happy to own his or her own pair of spats? 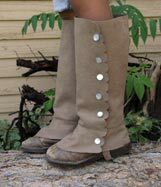 Ok, maybe most kids never think of spats -- or even know what they are -- but we just loved these spats we found on Etsy. If you do get these for your daper tot, be sure to let them in on a few cultural references to spats. 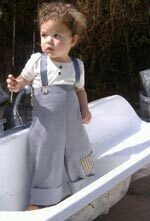 Also from the same Etsy store, these adorable Chimneysweep britches. Can't. Stand. The. Cuteness. When the first baby of the house has four legs, it's only natural to wonder what's going to happen with the new baby arrives. We can only imagine that in every dog/baby household, there has to be a little bit of canine/sibling rivalry bound to happen. 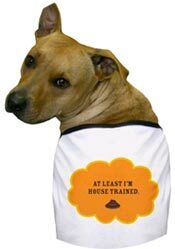 Although we're all for love between the four-legged friend and the new addition, a little of competition is good, right? 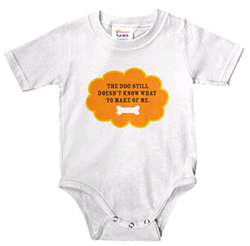 That's why we just had to make some merchandise that let's the world know that the baby has got to win over some canine trust. Because like our moms used to say: "it's not that we love you more, we just love you differently." Check out our Nested CafePress Store and stock up on some clothing for both your loved ones. Remember the other day when I said you can't filter for onesies over at Threadless. It seems that they've redesigned their kids store in the past two days and now can search by tees and onesies by size. There even seems to be more designs to choose from already. Yay Threadless! Sure, being born in the year of the dragon sounds a lot cooler than being born in the year of the pig, but for all those fortunate baby pigs being popped out this year they can look forward to a life associated with fertility, virility, happiness and honesty. How about highlighting their good luck with some baby gear celebrating their sign. Wanart offers Lunar Babies Baby Gear to Go, a bodysuit and bib set packaged in a quart-size togo container. Check out their Lunar Babies tote bags and cards. Don't know your child's Chinese astrological sign? Find out here.